I’ve never heard the word “fresh” so many times in one day! I just returned from the Wild Seafood Exchange up in Bellingham. It was an all-day event with speakers from the restaurant, fishing, cold storage, and marketing fields. Sponsored by the Port of Bellingham and others, the show focused on the needs of commercial fishermen. 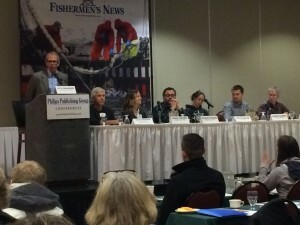 Peter Phillips, publisher of Fisherman’s News, and Pete Granger of Washington Sea Grant moderated the panel discussions. The emphasis throughout was helping fishermen connect directly to the end buyer, whether restaurants or consumers. The first panel focused on the restaurant industry, and what the chefs looked for when buying seafood.One chef mentioned that he likes to see his fish packed in “clean, white ice”. The blogger sitting next to me was taking notes and had written the word “fresh” and underlined it a dozen times. An audience member asked for clarification on what fresh meant, and the panelist elaborated. Obviously, keeping your catch at the right temperature is very, very important: too warm and the fish get ripe, too cold and they freeze when you only want them cool. So refrigeration was a “hot” topic! Other panels included direct marketing, sustainable fishing, web sites, cold storage, and legislative issues. I met many interesting people, and spoke with most of the presenters. A couple of people stood out to me. One was Sonia Strobel of Skipper Ottos (above, third from left). This is a unique business model that has since been copied throughout the country. It is very similar to the community supported agriculture (CSA) movement, where consumers buy a share in the farm and receive boxes of produce every couple of weeks. In this case people receive fresh fish in the summer and frozen, smoked, and canned products the rest of the year. 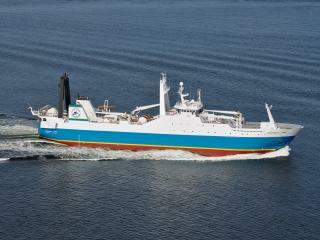 The seafood is sustainably harvested and the purchased directly from the fishermen. This cuts out the middleman, giving the fisherman a higher income and provides lower prices for the consumer. Plus it’s good for the fisheries. Fascinating concept. Skipper Ottos is in Canada but there are many CSFs (Community Supported Fisheries) here in the US. Another interesting place was Flying Fish Company out of Portland, Oregon. Owner Lyf Gildersleeve spoke about his sustainable, local seafood business. Not all fish and shellfish available in the storess and restaurants are good choices from an environmental perspective. Populations of seafood vary over time, both naturally and depending on how heavily they are fished. Some are in good shape, and those are the best seafood choices. And when you buy locally you help sustain your local economy, support endangered family farms, protect the environment, and help safeguard your family’s health. Again, cutting out the middleman gives you a better product with more of the money going directly to the fishermen. Local food is fresher, healthier, and just tastes better. There were lots of other great folks, sorry I don’t have room to mention everyone. I had a blast at the Exchange and plan to go back next year. And to all the people I met at the show: it was great meeting you, feel free to contact me any time. The Wild Seafood Exchange is a one day conference aimed at the independent commercial fisherman who wants to learn about marketing and direct marketing to restaurants, retailers, brokers and seafood buyers. Sponsored by the Port of Bellingham, this one day Expo is on Wednesday, February 25 in Bellingham. If you are a fisherman you might consider going. Paul Ivy with Teknotherm will be on hand to answer questions about our services. From refrigeration parts and service to rebuilding or replacing your RSW system, and anything refrigeration and cooling related, we can get you what you need, fast. 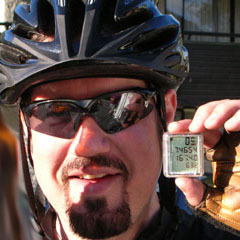 Look for Paul in his black Teknotherm hat and introduce yourself! Teknotherm Vice President Vladimir Sukharev recently returned from Dutch Harbor, Alaska after completing a five week sea trial on board the F/T Northern Hawk. At 341 feet, 5190 tons, and carrying a crew of 135, the Northern Hawk is part of the Coastal Villages fleet. Several years ago Teknotherm Refrigeration installed a plate freezing system. In 2011 a Mycom 200 VLD skid for freezing system and Mycom 125 LUD skid for RFW were installed. This year we returned to upgrade and modernize their automation and control systems. We replaced their old, obsolete Sabroe system with a top-of-the-line TeknoLogic SCA II. 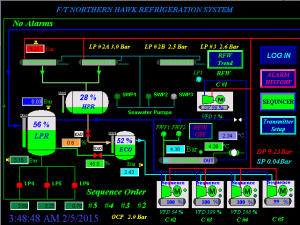 This new system allows remote control and monitoring of the refrigeration system to optimize use of the compressors, refrigerant flow, energy consumption, save fuel, and more. The new systems allows monitoring and troubleshooting from Teknotherm office in Seattle, to help the boat engineers troubleshoot an issue with the system if it ever arises. The graphic interface is simple to use and tells the engineer everything he needs to know at a glance. By carefully controlling and monitoring the system, it works at peak efficiency at all times. This ensures the product is kept at the ideal temperature so it brings the highest price at market, as well as using no more power than necessary to do the job right. 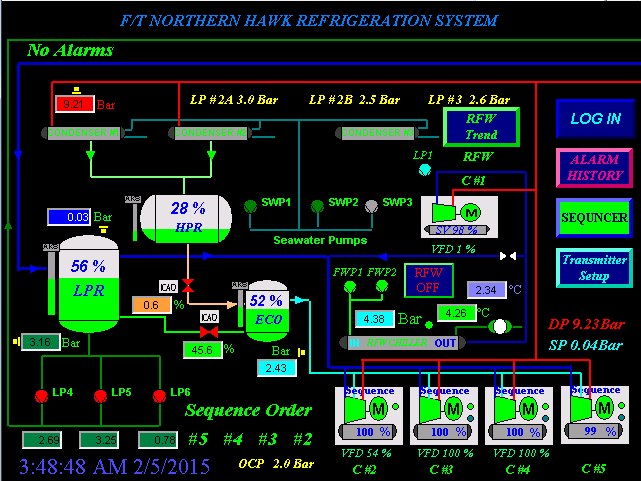 This control system was designed by our in-house engineers and built in our UL certified panel shop. In addition, we also replaced four compressors and provided complete start-up service. For more information on how our unique, user-friendly automation and controls can boost the bottom line for your vessel, call us at 800-782-1997 or visit www.teknotherm-inc.com. Teknotherm Refrigeration is pleased to welcome Paul Ivy as our new Sales & Marketing Manager. With over twenty years experience in sales and marketing, five of them in the HVAC industry, Paul brings experience and a new outlook to our team. Paul will be working with Chris to locate any parts you may need, and his years of supply chain experience will make sure you get them fast. He will also be updating our web site and social media, as well as handling advertising & marketing duties. If you need to discuss advertising or trade shows, speak with Paul. And he will be representing us at trade shows around the country. With his long experience, connections throughout the HVAC world, and dedication to delivering awesome service, Paul is a great new addition to our crew.